Blowout Sale! Free Shipping Included! 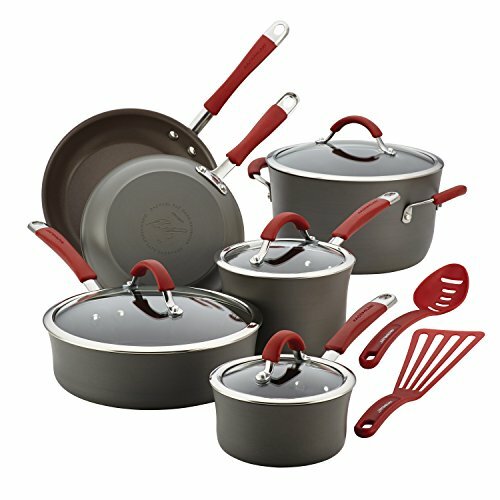 Save 67% on the Rachael Ray Cucina Hard-Anodized Aluminum Nonstick Cookware Set, 12-Piece, Gray, Cranberry Red Handles by Rachael Ray at Dining bench. MPN: 87630. Hurry! Limited time offer. Offer valid only while supplies last. Enhance the cooking experience with the durable, artisan-styled pots and pans in the Rachael Ray Cucina Hard-Anodized Nonstick 12-Piece Cookware Set. Enhance the cooking experience with the durable, artisan-styled pots and pans in the Rachael Ray Cucina Hard-Anodized Nonstick 12-Piece Cookware Set. Sturdily crafted from hard-anodized aluminum, the attractive rustic, modern cookware provides fast, even heating, helping to reduce hot spots that can burn foods. The appealing espresso-colored nonstick is PFOA-free and long-lasting to provide easy food release and cleanup. Offering a comfortable grasp, the rustically designed cookware's silicone-over-stainless-steel handles are dual riveted for added strength and boast an earthy, modern hue for a dash of color. The saucepans, stockpot and sauté feature shatter-resistant glass lids with wide stainless steel rims and allow simmering soups and sauces to be monitored without losing heat or moisture. Including two skillets, the cookware set also offers a sturdy yet flexible slotted nylon turner and spoon that match the handles' color. Oven safe to 400 Degree F, the pots and pans are suitable for all stovetops, except induction. Dishwasher safe for convenience, this cookware set makes a handsome addition to serveware, dinnerware and other cookware pieces in the beautiful Rachael Ray Cucina collection. Grace the stovetop and the kitchen with the inviting pots and pans in the Rachael Ray Cucina Hard-Anodized Nonstick 12-Piece Cookware Set.